This is a reader recipe from the latest good food magazine and it was so yummy! Such a fun thing to make with panther for Easter. A little expensive as you need a whole 2 bags of mini eggs, but luckily I already had the cranberries and I always use cheapo chocolate in recipes. Well worth a try! Apparently this will keep for a week… Not sure whose house that’s in though, wouldn’t last that long here! Fold cream in. I panicked at this stage as the cream melted a bit from the heat, although I’d left it to cool a minute first. However, it was no problem that it’d melted a bit, it set perfectly. I have a feeling the original recipe he copied was by nigella. This is halved so makes 2 ramekins full. Made this as our treat for firework night and it was yummy! It serves 6 for just over 600 calories each so not exactly the healthiest! I made my own puff pastry but would be so much easier if you bought it, I just ran out of money! I saw some of these in morrisons and had a real urge to make a Halloween haunted house. Then found that Lakeland sell cutters to make your house, making it easy enough even for me! We stuck this together with dark chocolate and made spiders, spiders’ webs and ghosts to decorate it, it looked amaxing! A photo will follow eventually but it’s on my old phone 😦 planning to do a Christmas one using white chocolate soon! Most recipes say to use icing to stick it together, but I find chocolate sets quicker and harder. What’s really good about this is that the biscuits were actually really delicious to eat, even after several days, so nothing was wasted! When cutting out the sides and roof you need to roll your dough out on the greaseproof paper, remove the extra bits, and lift the paper onto the tray. Don’t try to lift the gingerbread on its own as the shape will distort and then your house won’t work. Then put roof on in same way. I was worried about this, but mine was easy. Decorate with whatever ingredients you have / want. 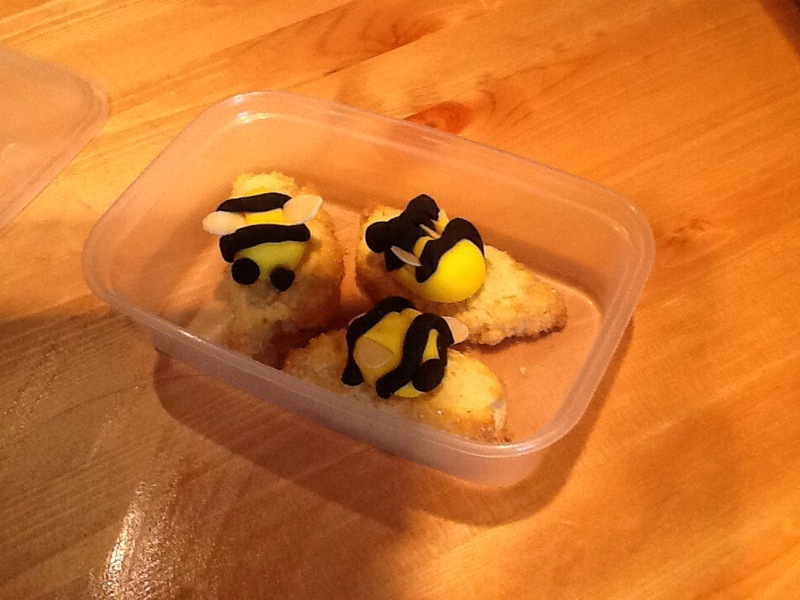 We used leftover coloured icing, initially bought from morrisons for the honey bee biscuits, which was very useful. This is a great recipe, strongly recommended for some fun time in the kitchen! I’ve eaten loads of home baking today, whoops! These are brilliant! Samantha desperately wanted to try honey, so we tried these out (she also tried the honey and almonds on the way and loved them). The original recipe is here in video form (which is really useful when baking with those who can’t read at all!) it’s from Cathryn Dresser, whose book I discovered in tesco last week. I intend to buy it as a present for Samantha for Christmas. My only comment on the recipe would be at you need more flour. I used the amount it ways and then at the end shook some more in until it was a realistic dough to work with. It started off way too sticky, there was no way we could shape it at all. Here is the finished item, complete with bees, some of which have been single-handedly decorated by panther, age 3! This was a great project, suggested it to Samantha a few weeks ago and she really took to the idea. It is a Frances Quinn idea from good food magazine, but she’s a bit complicated for is, which was putting me off. In the end I decided to simplify it loads, and make it loads smaller. I didn’t even read much of the recipe as it took up a full page and involved way too many steps! My way is loads simpler. 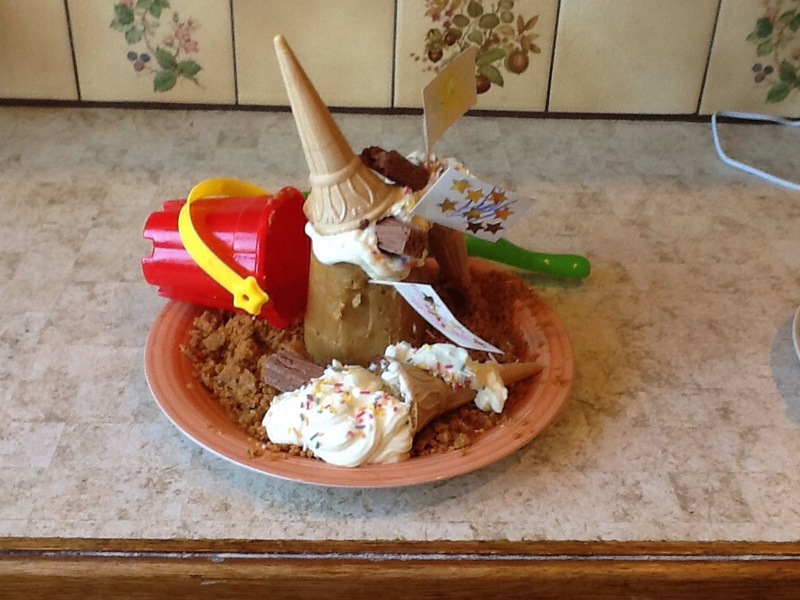 Luckily we had a really small bucket and spade which were a perfect size to make a cheesecake to do four portions. So essentially there are three individual elements to this cake… The biscuit beach, the sandcastle cheesecake and the ice cream cone cakes. Easy! If you’ve used normal cones you need to find a way to hold them upright. I used foil to wedge them into a casserole dish, which worked pretty well. If you’ve used stand up cones you’re laughing! Put the cake batter in a piping bag and pipe it into the cones. I didn’t do this, I tried to do it with a spoon. Which was tricky. But the main problem I had was I left the mixture poking out of the cone like an ice cream… But of course when it got hot it got wetter and dripped down. So pipe it right into the cone and let it magically rise up like an ice cream… And then use the icing to improve the effect! You can probably have a break for an hour now! Crush the rest of your biscuits and add to the ones you’ve got left over. You may need to add a bit of butter depending how you want it. I did but it’s up to you. Put the remaining cheesecake mixture in a piping bag, with a nozzle if you’ve got one (this was surprisingly easy too. I put the nozzle down the bottom of the closed bag, put the icing in, and then when I snipped the bag I could push the nozzle through the hole. Pipe the icing onto the cone cakes, so it looks like icing. Add sprinkles. This was really fun to make, and surprisingly cheap and easy! Took about two hours… And I was sitting down for an hour of it! Not really a recipe, just an idea! Panther, aged 3, absolutely loved dipping strawberries and flumps in this. Essentially it’s just melted chocolate, with something, whatever you have to hand really, to thin it out. Yum! The original recipe, such as it is, came from nigella’s feast cookbook. She included amounts which I have just ignored.